he took up his present homestead in May of that year. He put up an adobe house first, which served as a home for himself and family for four years, when a frame house was built. In that same year, Mr. Lubke was united in marriage to Miss Matilda Minska, and he took his bride at once to the new homestead. Their first few years there were very discouraging, as they lost their crops because of the grasshopper plague. Prairie fires, too, were a source of constant anxiety. The country was still so new that deer and antelope were quite plentiful, and a few elk were occasionally seen. Gradually their fortunes brightened, and from time to time, improvements were added to their farm, until now it is among the finest in that region. Mr. and Mrs. Lubke have had twelve children born to them, but only three of them - Carl, Ida and Amel are now living. Taking it all in all, a sketch of Mr. Lubke's life really shows a striking example of what may be accomplished by the exercise of industry, perseverance and good management, for he came to this state practically without much means, and has now achieved a signal success in his chosen calling. Jasper N. Aubert, residing on section twenty, township twenty-seven range five, of Antelope county, Nebraska, is regarded as one of the leading citizens of his locality. He has always been one of the important factors in the upbuilding of his region, aiding materially in its development and growth from the time of its early settlement. Mr. Aubert was born in Van Wert county, Ohio, November 3, 1854. His father, William Aubert, was a farmer, who died when our subject was but two years of age. William Aubert came to America from Germany at the age of fourteen years. He married Phoebe Carle, who was born in Maryland of Scotch descent, in 1801, her death occurring about 1865. Jasper's boyhood was spent in his native state. In the fall of 1874 he came to Nebraska, locating in Saline county, where he worked out for one year, then moved to Antelope county and filed on a claim, which is his present home. When he landed in this region his money was about gone, so he was obliged to seek work in order to get a start and provide the necessaries of life. He found employment with the construction gang of the Northwestern railroad company being put through from Plainview to Creighton, later was on the main line from Neligh to Valentine and in Iowa from Sac City to a distance of sixty miles north. After accumulating a little money he returned to his homestead, on which he built a dug out and batched it for two years, with occasionally a visit to a neighbor who furnished him with meals when desired, the latter also occupying a sod shanty. During his early years as a pioneer Mr. Aubert suffered many discouraging experiences, to all which the early settlers in the western country were subjected. On July 28, 1890, also June 23 of the same year, his crops, were totally lost by hail storms, and in 1894 he suffered severely financially through the droughts which prevented any crops being raised. In the blizzard of January 12, 1888, he had all of his cattle in the corral before the storm struck, but was fortunate enough to get through it without any serious mishap such as was the experience of so many who were caught in the dreadful storm. Mr. Aubert was married January 22, 1884, to Miss Lucy Fletcher, daughter of Wm. Fletcher, the ceremony taking place in Willow precinct, two miles from our subject's present home. To Mr. and Mrs. Aubert four children have been born, who are named as follows: Roy, Oscar, Edward and Esther. 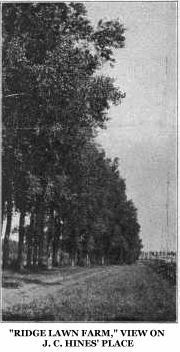 Mr. Aubert has on his farm one of the finest bodies of timber to be found in the west, consisting of a grove of ash and walnut covering fourteen acres, and extending for half a mile along the south side of his quarter section tract, which he acquired some few years after taking his original homestead, making in all three hundred and twenty acres. A fine bearing fruit orchard is one of the notable improvements. of the place, adding much to the income and the living of Mr. Aubert and his family, and all this, together with a complete set of substantial buildings, makes the farm one of the most valuable, and desirable in this section of beautiful Nebraska. Hans Thomsen, a well-to-do farmer and a leading citizen of Pierce county, Nebraska, whose residence is located on the northeast quarter of section five, township twenty-eight, range three, presents in his own career a striking illustration of the field of opportunity this northeastern county abundantly offers the ambitious, as well as the rich results that have long waited on industry and integrity. Mr. Thomsen was born November 20, 1865, in the village of Sturdebuell, providence of Schleswig, Germany, and is the son of Paul Henry and Marget (Jensen) Thomsen. The father was born in 1835, and served in the Danish army in the war with Germany in 1864. The mother was born in 1840.
tle each year. His large nine-room house was rebuilt in 1908, and the big barns and other buildings were all built by our subject. He also has a fine grove. Mr. Thomsen was married in 1892, to Miss Matilda Hladick, who is a native of Bohemia, born in 1870. Mr. and Mrs. Thomsen are the parents of five children, whose names are here given: Anna, Hannah, Henry, Katie and Bertha. They are of the German Lutheran faith, and Mr. Thomsen votes the republican ticket. Mr. Thomsen and family have a pleasant and comfortable home, and all our subject's time is spent in improving this and surrounding himself and family with all the comforts of a rural home. They have the respect and esteem of all who know them. Paul Nielsen, numbered among the leading pioneers of Howard county, Nebraska, is owner of considerable valuable property in that region. He has built up a splendid farm, passing through all the hardships and discouragements incidental to the development of the same, accumulating his possessions by dint of industry and thrift, and now enjoys an enviable reputation as a worthy citizen. In 1908 Mr. Nielsen retired from active farm life, purchasing a fine residence in Dannebrog, where with his family he resides, all being well known and highly esteemed throughout the community. Mr. Nielsen was born in Denmark on September 12, 1855, and grew up in that country. At the age of sixteen years he came to America with his mother, one brother and a sister, the father having emigrated here in 1870, one year previous. They located in central Illinois, remaining there for two years, when all came to Howard county, Nebraska, the father taking a pre-emption on section twelve, township thirteen, range twelve. Later he released this land and homesteaded on the same section, where they began to build up a home. Paul worked for his father for a number of years, then bought a homestead owned by his sister, consisting of eighty acres, and started to develop a farm for himself. He started in the stock raising business, became fairly successful, and was soon able to purchase another forty acres near his original homestead, which he devoted to grain raising, putting it in principally to wheat. Besides this he bought forty acres of school land, and several years afterwards sold part of this property and bought other land on section eighteen in Dannebrog precinct. Although starting out with practically no capital but his strong heart and willing hands, Mr. Nielsen has accumulated a fine estate. He never had the advantage of schooling except a few months in the year after coming to this country, but solely by his diligence and determination mastered the English language and made considerable progress along other lines of study, at the present, time being a man much above the average in intelligence, well read and up-to-date on all events of public interest. He is owner of half a section of fine land, also considerable town property, and is recognized as one of the leading and wealthy citizens of his locality. On January 20, 1883, Mr. Nielsen was married to Anna Cecelia Christensen. She is a native of Denmark, and came to America in 1882 to join two sisters, who had come here some little time before. They immediately settled on the farm and together worked faithfully to gain a competence. Mr. and Mrs. Nielsen have a family of ten children, who are named as follows: Martha M., living at home, Annie Christina, wife of Peter Nielsen, residing on a fine farm two miles north of Dannebrog; Willie C., who lives on his father's farm, Helena, wife of Magnus Jacobson of Dannebrog; Arthur A., Tora, Einer, Edna, Bessie and Gilbert, all living at home, except those who are married. Our subject's mother lived on their original homestead, until she reached the advanced age of ninety-three years and had the distinction of being the oldest woman resident of Howard county at the time of her death, which occurred on February 4, 1911. Mr. Nielsen is a populist, although he has never taken an active part in politics. For a number of years he acted as moderator of school districts thirty-one and seventy-four, and since coming to this region has done his full share in aiding in the upbuilding of his county and vicinity. James A. Ollis, senior, son of Mathias and Catherine (Armstrong) Ollis, was born in Montgomery county, Indiana, September 8, 1828, and was fourth in a family of seven children; he has one brother living in California, the other children being deceased. The father was of English birth and died in 1838 in Hancock county, Illinois, and the mother was a native of the state of Ohio, her death occurring in 1882 in Kansas. In 1836 the family went into Illinois, locating in Hancock county, where Mr. Ollis received his education in the little log school house of the early days in Illinois, and later engaged in farming. On March 2, 1854, Mr. Ollis was married to Miss Martha Brown, who was born in Ohio. Mrs. Ollis died in March, 1880, survived by her husband and five children: John M., who died in 1878; James A., who is married and lives in Mira Valley, and has eight children; Mary C., wife of George Stancliff, resides in Texas, and they have four children; Sarah C., died June 1, 1909; and Elizabeth A., who is married to Oliver Cromwell and resides in Ord. In the spring of 1884 Mr. Ollis came to Valley county, Nebraska, and purchased four hundred acres of land in Mira Valley, which remained the home place until 1904. On November 2, 1901, Mr. Ollis was united in marriage to Laura S. Ragan of Iowa. Mr. and Mrs. Ollis have one child, Clyde L., who resides at home. In 1904 Mr. Ollis retired from the farm and moved to Ord, building a good home where he now lives. He has been prosperous and successful, owning two hundred and forty acres of his original four hundred acres of fine stock and grain land, aside from considerable city property. Mr. Ollis has been an active public-spirited man, serving as justice of peace for four years; also as township assessor in 1890; he also served as moderator and treasurer of school district number nine over ten years. He is a man interested in all pertaining to the welfare of state and county, and enjoys the respect and esteem of all who know him. While Mr. Ollis has reached the very mature age of eithty-three [sic] years, he enjoys good health and is still very active and interested in all the affairs of life. George Heuerman, proprietor of one of the most valuable estates in Madison county, Nebraska, has been a resident of that locality for many years. He is prominently known throughout the county as one of the foremost farmers and stock men in Nebraska, and after many years hard labor in building up his business is now prepared to enjoy the remaining years of his life in peace and comfort, surrounded by a host of good friends. Mr. Heuerman has now retired and lives in Battle Creek. Mr. Heuerman is a native of Germany, born January 20, 1840, in the province of Aldenburg [sic], the son of Herman and Anna (Lueeschen) Heuerman, the latter having died when our subject was two years of age. In 1868 Mr. Heuerman left his native land for America, embarking at Bremen on the steamship "Deutschland," and for two weeks was on the water. After landing in New York, where he remained one week, Mr. Heuerman went to Wisconsin, where he lived one year in Milwaukee, working there in a mill for thirty-five dollars per month. In 1869 he came to Omaha, Nebraska. There he bought a pony and rode to what is now known as Norfolk, but at that time the town consisted of but one building, which was the postoffice and store combined. This building was made of logs, and was sixteen feet by fourteen feet. He then proceeded to Madison county, where he took up the homestead on which he now resides. He first built a log house in which he "batched it" a few years; in 1873 he built a frame house., hauling the lumber from Columbus, fifty miles distant, this dwelling being sixteen feet by twenty-four feet, and twelve feet high. In the pioneer days many hardships and disappointments, owing to crop failures, etc., were experienced by the sturdy sons who braved the unknown dangers of this region; the drouths and grasshopper pests were about the worst causes of calamity, the latter eating up every vestage of crops, leaving a bare, rough surface where a short time before their coming had been luscious, thriving vegetation. During this period ten dollars was all the money that Mr. Heuerman had to spend in a year. In the first year of his residence here, he experienced the hardest blizzard he ever saw, that of January 1, 1870, which lasted three days, and in that storm and one later during the, winter, which was a severe one, he lost considerable stock. Deer and antelope were plentiful in those days on the western frontier, and could frequently be seen in herds grazing on the open prairie. Mr. Heuerman was united in marriage July 4, 1871, to Miss Emily Fanske, a native of Wisconsin, and Mr. and Mrs. Heuerman are the parents of seven children, four of whom are living: Minnie, Bertha, Ella, and Herbert. Mr. Heuerman now owns two hundred and ninety acres of fine land which is well improved with good buildings and a beautiful home. This is an ideal farm, the beautiful Elkhorn river running through the land, being a natural source of irrigation to the fine groves of trees that line the river's banks. Among the old settlers of Cedar county, one of the most prominent is the above. Not only is he noticeable because of his long residence in the county, but also because he is one of those progressive and aggressive citizens, whose perseverance, integrity, industry, thrift and economy have added so much to the natural wealth of the state, and have contributed so much to its development and growth. Mr. Hines is a native of New York state, and was born there in 1832, the son of Joseph C. and Mary Hines. The father died when the subscriber was but a small boy and the bringing up of the little family devolved upon the mother. ber was hauled a considerable distance, from Jones' mill. Mr. Hines suffered all the usual vicissitudes of an early settler's life, and it probably seemed had even more than his share of the prevailing misfortunes. The very first year of his residence in Cedar county, the grasshoppers took every bit of his crops, thus making it necessary for him to start anew the next year. Prairie fires were of common occurrence, and many times Mr. Hines and his family were compelled to fight the fire for hours in order to insure the safety of their little home. Even as late as 1894, all crops were a failure owing to the prevalence of hot, dry winds, which destroyed everything growing. However, Mr. Hines was one of those persevering men who will never own to being defeated. When crops were destroyed one year, the family existed somehow until time for the next year's crops to be harvested. Improvements to the home and farm were added gradually, and more land was secured from time to time, until at the present time, Mr. Hines owns about three hundred and twenty acres of well improved farming land, most of it under cultivation. There is about ten acres of timber near the home, all of which was planted by himself. An interesting view of the place appears on another page. Mr. Hines was united in marriage to Miss Julia Frost, of Geneseo, Illinois, and they are the parents of four children, all of whom are living except one. They are named as follows: Emma S., Eva C., deceased, twins; Hamlin F., and William. By reason of their long residence in the county, Mr. Hines and his family are unusually well known. They have been prominent factors in the development of the community in all lines. 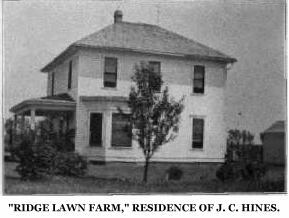 "Ridge Lawn Farm," Residence of J. C. Hines. "Ridge Lawn Farm," View on J. C. Hines' Place. William A. Pierce, of a prominent and well known family of Custer county, is a native of Mower county, Minnesota, born March 8, 1865, fifth in order of birth of the eight children of James and Jane (Hunt) Pierce. A sketch of the father appears elsewhere in this work. Mr. Pierce received his education in his Minnesota home and at the time his parents came to Custer county he remained behind to come with the carload of household goods and machinery which was shipped to Grand Island and hauled by wagon to the homestead farm. He joined the family some little time after the others had reached the new home and remained with his father until going out into the world for himself in his twentieth year. He and his brother Alfred began farming and raising stock in partnership and this connection lasted about fifteen years to their mutual benefit. He was also an original homesteader, having secured a pre-emption when he reached his majority and his homestead some time later, and he still owns a portion of his pre-emption, which is located in Somerford valley. On October 30, 1901, at Lakeland, Brown county, Nebraska, Mr. Pierce was united in marriage with Etta May Stevens, a native of Minnesota, and daughter of Franklin and Annie (Cox) Stevens, her father a native of Maine and her mother of Wisconsin. The parents were married in the latter state in 1864. The mother died in Minnesota in 1886 and the father still lives there. Of their children, the following survive: Mrs. Pierce; Charles lives in Antelope valley, Custer county; Edwin B., lives in Brown county, Nebraska; Olive lives in Cherry county. Born in the west and western bred, Henry L. Peck, editor of the "Randolph Times," is essentially western in all his thought and sympathy. His birth took place at Anamosa, Iowa, March 17, 1868. His father, L. B. Peck, a merchant of Anamosa, is a native of Pennsylvania, who came to Iowa in 1856. The mother, a native of New York, was born in Cortland county and married in Anamosa, Iowa. Mr. Peck began his journalistic career before he had fairly completed his course in the highschool. He was employed about two years on the "Anamosa Eureka," and an equal period on the "Journal;" he was also employed at the case in Monticello, La Grand, Gladbrook, and Rockwell City, in the latter place about two years. Returning to the east part of the state, he was on the staff of the "Pioneer," at Cascade, for five years, from which place he started to the west. In September of 1900, he came to Randolph, purchased the "Times" when its circulation was at a low ebb and at once began to install new life into it; the circulation has steadily increased from year to year until it now has a paying subscription of over eight hundred, with a good patronage in its advertising columns. The job department is fully equipped for all classes of work, and an excellent quality of the art preservative is turned out from the "Times" print shop. Mr. Peck was married in Anamosa, August 27, 1895, to Miss Gertrude Burch, a native of Iowa, and daughter of M. G. and Jane (Gleason) Burch. Four children have been born to Mr. and Mrs. Peck, namely: Neva, Floyd, Dorothy and Gertrude. * Punctuation shown as it appears in the original book. support. He is a member of the Presbyterian church; he affiliates with the Ancient Order United Workmen and the Odd Fellows, the latter of which he is the past grand, and has been their representative in the grand lodge; for six years he has been secretary of the Northeastern Nebraska Odd Fellows' Association, an auxiliary organization intended to promote better acquaintance and fellowship in the fraternity. Among the leading citizens of Merrick county, Nebraska, none stands higher in the minds of his associates than the gentleman here named. For many years he has been a resident of this section, and with his family enjoys the comforts of a pleasant rural home, and the esteem of all with whom he comes in contact. Thomas Fauquier was born in Keokuk, Iowa, October 8, 1860, and was the youngest of three children in the family of Ephriam and Margaret (Gosnell) Fauquier, who had two sons and one daughter born to them. The father was a veteran of the civil war, enlisting in Company C, Third Iowa Volunteer Cavalry from Birmingham Iowa, in September, 1861, and died in Benton barracks from exposure and cold contracted during the Siege of Vicksburg. He was survived by his widow and three children. The family moved from Iowa to Louisville, Kentucky, in 1866, and to Danville, Illinois, in 1868, and in the fall of 1872, our subject's mother and her three children, Charles, Lizzie, and Thomas, came to Merrick county, Nebraska, and made homestead entry on the south half, southeast quarter, and south half, southwest quarter, of section twenty-two, township thirteen, range eight, and this has been the home farm until this date. Thomas Fauquier, from his twelfth year, grew up in Merrick county on the old farm, which is still his home place, and also that of his mother, who is now in her eighty-seventh year. His brother, Charles, now lives in Holt county, Nebraska, and his sister, Lizzie, who was the wife of George W. Welton, is deceased. She left seven children. Mr. Fauquier was married to Miss Bell Bruno, November 21, 1897, on the Gosnell farm, just north of his own home. Mr. Fauquier grew up to manhood in Merrick county a farmer and stockman, and he is one of the few pioneer boys that still live in their old original homestead farm. He is at the present time deputy county assessor in Prairie Creek township, and also moderator in school district number twenty-eight. He has always been a strong democrat. Mr. Fauquier is a man who has always taken his part in the upbuilding of his county. Mother Fauquier is a woman of the pioneer days who brought her little family into Merrick county in the early years to brave whatever the future held in store for them; and they are today one of the well known families of their section, and hold the respect and esteem of a large circle of friends. Mr. Fauquier is a man of sound principle, and possesses the sterling qualities which when combined go to make the perfect man. Like so many of the citizens of the northern part of Knox county, Nebraska, the subject of this review is a native of Bohemia, born in the village of Lhota, Cheslav District, on December 8, 1863. His parents came to America with their family in 1867. In his native land the father was employed in the sugar refineries of the beet district, and was familiar with the entire process of sugar making. He was also a first class carpenter, following that work when not needed in the sugar factory. On reaching New York, they immediately crossed to New Jersey, where Mr. Vlasnik secured farm work and followed that occupation during one year, then taking his family to Chicago. There he found employment. in a planing mill part of the time, and filled in with various other kinds of labor, until 1870, at which time he joined a colony of fellow countrymen who were coming west to find homes and satisfy their desire for land. From Chicago the colony traveled to Sioux City by rail, thence by boat to Niobrara, which was then located on the old site on the river bank. Here the colony divided, some settling in Yankton county, South Dakota, others coming on to Knox county, our subject's family settling on a claim near Pishelville. All went very well for a few years, but in 1873 and 1874 the grasshopper raids reduced them to the very lowest ebb of poverty, leaving nothing to feed people or stock. When later crops were secured, there was little market for the products, many carrying a little produce to Fort Randall, twenty-five miles away, and through a country filled with unfriendly Indians, who were at all times a menace to the white settler. Horses were beyond the means of many of the pioneers, and some carried their products to market in a wheelbarrow. Six families living rather near together pooled their money and bought a pair of oxen which they used in common. himself and wife keeping boarders to make a little money, as there was nothing else for him to do. He decided to go to New Mexico for settlement, and started on the way, but traveling southward he fell in with a party of emigrants from that region, so turned back at Colorado Springs, feeling that a country which the people were leaving in such numbers certainly could not be a very desirable location. He soon afterwards came into Knox county and engaged in business in Niobrara, continuing some sixteen years. In the spring of 1904 he became interested in the Niobrara Roller Mills Company, which he still manages, turning out an excellent grade of flour and meal for the local trade. In the fall of 1909, Mr. Vlasnik was given the preference for sheriff of the county, and although the county is normally republican, and he a democrat, he carried the election by an overwhelming majority,. taking the reins of office on January 1, 1910. Those who know him best testify that he is a man of undaunted courage, to whom fear is a stranger, and will not be a disappointment to those who have placed him in office. Mr. Vlasnik is a prominent member of the Masonic fraternity, Woodmen of the World and of the Bohemian Benevolent Society, Z. C. B. J., while Mrs. Vlasnik is a sister in the Order of the Eastern Star. Mr. Vlasnik was married on September 19, 1886, to Marie Tomek, and to them have been born three children, two of whom survive. Their daughter, Anna, who after graduating from the Niobrara schools, attended the Belleview college, and later graduated from the State Normal at Peru, has taught two successful terms in the country, and since the fall of 1906 has been one .of the efficient members of the faculty on the city schools of Niobrara. Mr. Vlasnik's only son, George, completed his course in the city schools, and afterwards entered the State University, from which he will graduate with the class of 1912. The family enjoys a wide circle of friends and their home is one of the most comfortable and hospitable spots to be found in a day's travel. For over twenty-five years the gentleman whose name heads this personal history has been associated with the agricultural and commercial interests of East Newman precinct, and is one of the well known old settlers of Nance county. Mr. Agnew is proprietor of a fine tract of farm land lying three miles southeast of Fullerton, also has a beautiful residence in the town, where he has resided since retiring from active labor several years ago. Besides this property he has considerable land in North Dakota, all of which has been accumulated by persistent and honest labors, gaining for himself a high reputation as a loyal friend and supporter of the best interests of his locality. William S. Agnew was born in Park county, Indiana, on November 12, 1836, and is a son of Gibson and Eleanor Agnew. His boyhood was spent in his native county, and at the age of fifteen years he accompanied his parents to Cedar county, Iowa, where his father settled on a farm and they worked the land together for about ten years, then took a farm for himself, remaining in Iowa up to 1884, when he came with his family, consisting of wife and three children to Nance county, Nebraska. Here he purchased four hundred and eighty acres situated three and a half miles east of the then small town of Fullerton, lived on the place for three years, then traded it for a stock of dry goods in Fullerton, and carried on the business for two years, at which time he again located on a farm of one hundred and sixty acres, which he purchased, and which has been their home since that time up to 1907, when he quit active farming and now rents his land. Mr. Agnew married Mary C. Barclay, a native of Pennsylvania, at Tipton, Iowa, January 24, 1861. To them have been born six children, as follows: Arthur C., Irwin C., who died in 1863, Loretta J., died in 1864, and Eleanor, in 1897; Mattie, wife of Rufus Lumrey, residing in Omaha; John G., living in North Dakota. Besides their own children, Mr. and Mrs. Agnew raised and educated a grandson, Floyd C. Agnew, who is now in North Dakota. The entire family are held in the highest esteem by their associates. Mr. Agnew was director of his school district during the early years of his residence here, also held the office of road supervisor. He is an ardent Presbyterian, and has been elder of that church for forty years. Nebraska as it was known at the time of the civil war is known to but few of the remaining residents of the state, partly because there were comparatively few citizens of the state at that time, and partly because that few has been disseminated by death. Mr. Smith was born in Boone county, Iowa, May 5, 1855, a son of Solomon and Rebecca (Dailey) Smith. The father was a native of the Cumberland mountains, near the borderland between Kentucky and Tennessee, and the mother's nativity occurred in Ohio. They came at separate times to Fulton county, Illinois, where they were married. They later moved to Wappalo county, Iowa, from which place they moved to Boone county, in the same state, where they resided until migrating to Nebraska in 1864. Crossing the river at Nebraska City, the family settled in the small village of London, near Peru, in Nemaha county. farm near Syracuse, in Otoe county, Which he operated some three years, having married during the time. In the spring of 1883 he came to Holt county, having settled on a pre-emption claim some six miles east of Eagle Mills, and where he also secured a timber claim. After six and a half years here he moved to Platte Center, in Platte county, where he resided for a like period before trying his fortune in the state of Missouri. Malaria drove him out of Cedar county, of that state, within seven months, and he found an asylum in Boyd county, Nebraska, and settled three miles south of Spencer, where he lived two years. The summer of 1900 was spent in Cherry county, six miles northeast of Wood Lake, near where some of his kinsfolks [sic] lived. In December of that year, they became residents of Jefferson county, Iowa, where they bought the farm belonging to the mother of Mrs. Smith, and resided until their return to Boyd county, in March, 1903. For a year Mr. Smith and his son operated a rented farm, and since that time he has resided in the town of Spencer. He is an expert carpenter and has work at hand the year round. He learned the trade from his father, who, besides being a fine craftsman at carpentry, was a good wagon-maker as well, and his skill with wood-working tools did not end here, for as fine cabinet work came from his bench as from any artisan in all the region. Mr. Smith was married December 24, 1882, at Libertyville, Iowa, to Miss Saletha Hall, a native of Van Buren county, Iowa, a daughter of William and Annie (Dailey) Hall. Her grandfather, Jacob Dailey, attained the unusual age of ninety-four years, and one of his daughters lived to be nearly the same age. Four children have been born to Mr. and Mrs. Smith: George, works with his father at the carpenters' trade; Raleigh lives in Spencer in a neat new cottage overlooking the Ponca valley; and Ora May and Anna, the two latter at home. Mr. Smith is a republican in political views, and works for the candidates bearing the party banner. At the time of the blizzard of January 12, 1888, Mr. Smith was at the barn caring for his horses when the storm broke. He remained there until after one p. m., carried water for his stock, and then tried to find his way to the house, which, of course, could not be seen at the distance of a yard. Twice he lost his way in the short distance between the two buildings before he got his bearings and found himself safely within doors. He has fought prairie fires, as have all western men of early days, and he has encountered some of the severe hailstorms that at times sweep over the west. His brother was returning home on the third of July, 1884, when such a storm broke over them. Mr. Smith, grabbing a bread board from the kitchen, rushed out with it over his head to open the gate that his brother, whose horses were frantic, might get safely into shelter. Life in a "soddy" is not unknown to Mr. Smith, he having twice lived in that comfortable sort of dwelling. At the time it was necessary to have the Vigilance committee, Mr. Smith was living in Holt county, and at times his residence served as court house and jail. The outlaws were captured and given legal trial wherein judgment was regularly rendered against them. Nearly all of Mr. Smith's relatives have removed to the coast, four of his brothers residing in the Hood River valley, Oregon. One of them drove through to his destination, from the east, with an ox team yoked to a covered wagon. Mr. Smith has an acquaintance with the red man and his ways, and among his personal friends of this race is the famous old chief, Yellow Horse. Among the representative farmers and stock-men of Boone county, Nebraska, who have aided materially in the development of that region, striving to advance the best interests of the community whenever possible, a prominent, place is accorded Charles W. Culver, who resides on section twenty-seven, township twenty, range six, where he lives on his farm of one hundred and seventeen acres. His beautiful home is called "Elm Place. Charles W. Culver was born October 30, 1857, in Dane county, Wisconsin, the son of Alanson and Abigail (Hatch) Culver, and was sixth in a family of eleven children. In the spring of 1878, Mr. Culver came to Boone county, Nebraska, and homesteaded one hundred and sixty acres of land twelve miles north of Albion, selling the same a few years later, when he purchased one hundred and seventeen acres on section twenty-seven, township twenty, range six, where he now resides, as before stated. He also owns one-half section of fine farming land one and one-half miles south of Albion. Mr. Culver deals in. fine stock, and makes a specialty of short horn cattle and Poland China hogs. Mr. Culver has served his community well in a way that has brought credit to himself and satisfaction to his people. He has served as assessor from 1886 to 1890, inclusive, and was treasurer of school district number twenty-three, which office he filled faithfully for ten years.